Mining and mineral companies rely on Big Top for bulk storage facilities. Our fabric structures are perfect for bulk storage because they can be built to nearly any size. And, with no internal guy wires or support beams, every square inch of the interior space can be utilized. All materials stored under one of our structures will be well protected from the elements. Not only will the fabric roof provide shelter from rain, snow, and wind, it also blocks 99.95 percent of harmful UV-A and UV-B radiation, ensuring the integrity of your materials, prolonging the lifespan of your equipment, and keeping your staff safe and comfortable. Big Top’s tension structures are one of the most versatile options for bulk storage. They can be easily transported, quickly assembled, and anchored to nearly any foundation, making them ideal for mining and mineral companies that have their base of operations out in the field. There are many accessories available to meet any of your bulk storage needs. For instance, if your materials require a climate-controlled environment, we can include an HVAC system and insulation. The fabric roof of your structure can provide many energy efficient benefits. Due to its radiation-blocking properties, it helps to maintain an interior temperature that is 15 degrees cooler in the summer and warmer in the winter, on average. It is also translucent and will allow in enough natural light to illuminate the interior without the need for artificial light, which can go a long way toward reducing your energy costs. 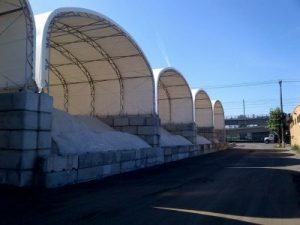 Learn more about utilizing a Big Top fabric structure as a bulk storage facility for your mining and mineral company by contacting us today.